An ASPCA veterinary staff member returnes a dog to her family after spay surgery and vaccinations at the Fall Fiesta event in Central Park. Spaying or neutering helps your pet live a longer, healthier life, saves you money, and fights pet overpopulation and euthanasia. These free or low-cost clinics and programs can make this important surgery more affordable. Learn more about spay/neuter. Visit our NYC Spay/Neuter & Microchipping Events page for a list of upcoming spay/neuter clinics in New York City. $5 spay/neuter, rabies and distemper vaccination, nail trim, and e-collar on a mobile clinic in all five boroughs with proof of public assistance. $125 per animal if you are not on public assistance. Dogs: Spay/neuter free for all Pitbulls and any dog whose owner receives public assistance (please bring photo ID/proof of public assistance); $50 for mixed-breed dogs; $250 for purebreed and designer (two purebreed parents) dogs. Low-cost vaccines and other treatments are also available with spay/neuter. Cats: Neuter is free for male cats. Spay is free for female cats whose owners receive public assistance (please bring photo ID/proof of public assistance) or $60 for female cats owned by NYC residents not receiving public assistance. The Toby Project also offers free spay/neuter and low-cost vaccines and other treatments in all five boroughs for feral cats. TNR caretakers can call to schedule a spay/neuter clinic. 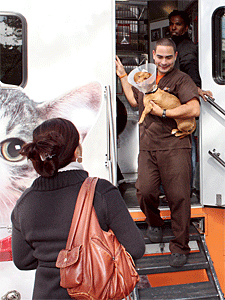 Low-cost spay/neuter on Long Island on a mobile clinic. Spay/neuter also includes a physical exam and pain management. No additional charge for pregnancy or heat. Check website for prices. Vaccinations and other tests and treatments are available for an additional low fee. $125 spay/neuter one day each month for rabbits between four months and one year old. $150 spay/neuter for rabbits six months or older. Call to be added to the list; once there are 4–5 rabbits on the list, owners will be contacted with the surgery date. Advance credit card or cash payment is required. Offering free spay/neuter services, pet food, and supplies for low-income pet owners, and assistance to those facing financial hardship due to a veterinary emergency, with the goal of keeping pets in their homes. Applicants are evaluated on a case-by-case basis and must meet certain criteria. Each year on the last Tuesday of February, veterinarians and their staff, animal welfare professionals, business owners, and concerned citizens join forces nationwide to spay or neuter as many animals as possible. The Kent Spay/Neuter Clinic offers one of the lowest prices on Long Island to the public for dog and cat spaying and neutering. Over 3,000 animal are sterilized each year at the clinic. Three licensed veterinarians perform the surgery assisted by a professional staff. Appointments must be made in advance. The SAS Wellness Clinic offers low-cost spay and neuter services by appointment. The clinic also offers free spay and neuter services for Pit Bulls within the Southampton township. Low-cost mobile spay/neuter clinic dates and locations are listed on their SAS Spay & Neuter Mobile Clinic page. If you are a Trap-Neuter-Return (TNR) colony caretaker, visit the Feral Cat Spay/Neuter Programs & Clinics page of the NYC Feral Cat Initiative website for more information on affordable spay/neuter options for feral cats.